So, it’s been suggested to me that I start a “Linux basics” series, and I think it’s a wonderful suggestion! That said, to me the most logical starting point after an installation (which there will be more in-depth articles to come about!) would be learning how to update your system; as most distributions are not up-to-date when freshly installed. Most distributions will have a “Software updater” or “Update Manager” in the program menus, which are fairly straightforward really, so I won’t touch base on them much in this. The graphical update manager displays available updates and while you can go through the list of available updates and make modifications to what you want installed, it is often as easy as clicking on a button to get the update process started. This way of updating may appeal to users switching from Windows even though the Update Manager's on Linux display more information than Windows Update. Instead, I’d prefer to show you how to use the terminal for the task of updating, as I find it significantly faster for routine management. If there are any upgrades needed, simply typing “y” and then pressing enter, will update all needed packages. Very quick, very simple. There are other commands many Gentoo users may choose to do a variation of afterwards, but I would call these three essential. Learning to update your machine via CLI is very simple as you can see, and is an easy introduction to using the terminal, and help lower fear of it. Now you: What’s your preferred updating method, on which distro? Mike looks at the two available options that Linux users and admins have to update Linux systems. He concentrates on Terminal commands as the graphical update managers are mostly self-explanatory. sudo apt-get dist-upgrade is better and more full proof than simple sudo apt upgrade. A quick read of the man page will tell you why its better and wisest choice. I was going to type out a big explanation, but then I remembered a thread I came across a few months ago when I was looking up some other things, that I’ll reference. With that said, for home users, you’re correct that it’s probably the ‘wisest choice’ as it tends to ‘just work’ better for dependencies. Following the commands in the article, i.e. apt instead of apt-get, apt full-upgrade would be advisable. AFAIK, sudo apt-get dist-upgrade will also update your Linux kernel, which may bork your system. So, before doing this, ensure that you have a stable Linux kernel to fallback or revert to. … IOW, Linux users should have at least 2 stable Linux kernels installed with the newer kernel running. … But it is OK to upgrade the Linux kernel to the newest version or to the next or higher series, eg from the stable and running kernel 4.4.97 to 4.4.112 or from the stable and running kernel 4.4.97 to 4.13.32. Too many installed Linux kernels will fill up the small-sized Boot partition = borky system. So, best practice to keep only 2 or 3 stable kernels installed. I think apt-get update and apt-get upgrade is the same as the Refresh GUI in Update Manager and Refresh in Software sources of Update Manager. When I inquired about auto kernel upgrade (upon noticing that DID happen on my xubuntu install, but did NOT happen when upgrading another box which is running a different debian-derived distro)… I was told that a dist-upgrade will only auto-upgrade minor incremental kernel versions. For instance, if you had 3.16.1 installed ~~ no auto-upgrade when a 4.9.x or 4.13.x kernel becomes available in repository, and YES auto-upgrade is performed if a version 3.16.4 becomes available in the repository. off topic I’ve watched manjaro rise on distrowatch to #2 now, wow, it might replace mint, lol. Replace Mint? Should never use it in first place, if you actually care about the security of your machine/network you use some minimal Ubuntu installer and add whatever WM ontop. Considering that both Mint and Ubuntu are configured for password-less sudo, it’s inane to debate the relative “security” provided by either. Care to explain your comment about password-less sudo? I’ve always been prompted for the password on both Ubuntu and Mint. I almost asked the same question as Jason. I saw that my (ordinary) user account in Mint had been made a member of the sudo group by default, but I get asked for my password all the time, too. I was on the verge of learning how to look inside the sudoers file to see exactly what default permissions and constraints sudo members had been given, but family obligations called me away and now I’m all tuckered out. My memory isn’t good enough to give a task-by-task rundown, but I don’t feel like I’ve been asked for my root/sudo password any less often in Mint than I have in any other distro I’ve tried. So what, then, is this “password-less sudo” allegation all about? Several months ago, someone (else?) posted a gHacks comment dismissing Mint as an unworthy distro and didn’t respond when asked why. I’m perfectly willing to listen to evidence-based critiques, but so far I’m getting a strong feeling that personal bias is at play. Mint is exceptionally easy to use out of the box for newcomers. If it’s not up to par in some important way, I’m going to need more than ipse dixit to back up that claim. 1.7.2. Starting with Linux Mint 18.2, the root password is unfortunately no longer set by default. This means that a malicious person with physical access to your computer, can simply boot it into Recovery mode. In the recovery menu he can then select to launch a root shell, without having to enter any password. After which your system is fully his. He can then do all kinds of nasty things. Like changing your own password…. Press Enter. Type your password when prompted; this will remain entirely invisible, not even asterisks will show when you type it, which is normal. Note: I advise to make the root password (“UNIX password”) identical to your own, in order to prevent problems later on. For good measure: a bad guy with physical access to your computer, also has other means to acquire root authority on your computer. So this fix certainly doesn’t make your computer completely safe: physical access always remains a risk. What this fix does, is blocking one much too easy way to get such unauthorized root access. Which increases security somewhat. I had previously always been asked to set a root password when installing Linux Mint (and that root password obviously remained in place during subsequent in-place upgrades), so I had no idea what you were talking about. You were right! No, Ubuntu is the most popular distro according to Distrowatch. Distrowatch and Ubuntu are on war for years. That’s the real reason Distrowatch keeps splitting Ubuntu flavours as separate unlike other distros. Have you seen Distrowatch to split Mint to Mint Cinnamon, Mint Mate or Manjaro XFCE, Manjaro Gnome etc? They keep dividing Ubuntu for “mysterious” reasons. Your posting is assuming Distrowatch is an accurate gauge of actual Linux installs. Being based on page hits to rank distro ratings, it reflects a viewer base that is more ‘looking’ for info while leaving out some significant numbers, all those who just don’t need to. War? C’mon, dw has repeatedly explained that Canonical had REQUESTED separate listings for each of the official desktop versions. No, they are not divided after Ubuntu’s request. That’s a Distrowatch lie. I had asked about it a year ago on Ubuntu forums. A well known moderator there told me that Canonical has never asked to divide them. They split them because they came up with a silly excuse that the flavours have also their own sub-sites. Distrowatch just came up with this lame excuse to promote other distros. 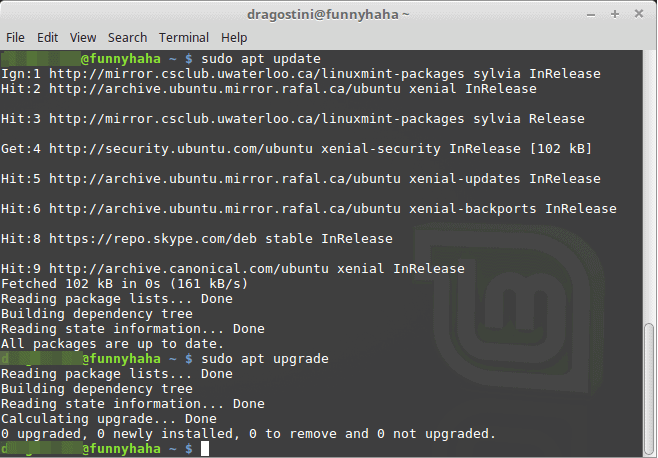 Once in a while a repository will hang and wanting to know which its easy to see if I update through terminal. I upgrade through the gui however, it helps me get a better feel for the packages being installed. Am currently running a highly tweaked (for me anyhow) lubuntu on this older 32bit. G’day, Mike. Please keep up the good work with your Linux tips and tricks. Anything that encourages new users to try Linux and helps them along with in-depth tutorials, can only be a good thing. Mark, even though this is a back-to-basics post, you consciously skip the installation of a Linux package, which does not make sense to me. IMO it would useful to write a post about that. I installed Virtual Box on my PC to try to get a feeling for Linux, but when I wanted to use it I got bogged down in not being able to save the settings. I know that is a VB issue, but people will probably want to try out Linux before installing a package, and a virtual machine is an important step in that. The most important thing to know about running Linux in VirtualBox right now is that you shouldn’t install the current version of VirtualBox and its Extension Pack (5.2.26), but version 5.2.24 instead. Except for 5.2.24, Linux Guest Additions for every version of VirtualBox since 5.1.28 don’t support hardware acceleration in guest Linux OSes, so your Linux machines will run in slow, resource-hungry software-emulation mode. Oracle released an experimental fix for the problem in 5.2.26 in the form of a developmental 5.2.27.xxxx Extension Pack, but it didn’t work for me. Just stick with 5.2.24 until you’re certain the problem has been resolved; it will save you a lot of time and hassle. Other Useful Tip: Start out by making yourself a generic Linux machine in VirtualBox with all of your basic preferences (including notably all of your shared Windows folders). Then, when you want to install a new distro, do a full clone of the generic machine, rename and modify it as appropriate (e.g., for the new machine’s basic Linux type), launch it, and install the distro in it. If you use a lot of shared Windows folders, as I do, it will save you a bit of time and mindless tedium each time you install a new distro. Once you’ve installed a new Linux distro, don’t forget to install the correct Linux Guest Additions, and if you use shared Windows folders, don’t forget to add the vboxsf group to your user account’s group memberships. Actually, I should have added that if you are NOT running VirtualBox 5.2.24 (or 5.1.28 or earlier) and you DIDN’T turn off 3D acceleration in the Linux machine’s Settings in VirtualBox, when you boot the machine you probably won’t even make it to the graphical log-in screen. You’ll just get a blank screen with a cursor in the upper left. You may be able to switch from the dead graphical interface to a working terminal interface by doing Alt+Tab or Ctrl+Tab, but I didn’t think to try it. Really, just stick with 5.2.24. @a different Martin: thanks for your detailed reply, I appreciate it. I have version 5.2.4 r119785 (Qt5.6.2) installed, and it runs in slow, resource-hungry software-emulation mode. I got very frustrated with it, and when I read that you have to go into the BIOS to change the hardware acceleration I gave up. It is still installed but I have not used for a couple of months. I like your idea of setting up a generic Linux machine, then making clones of that for each new distro. But 1) how does one make a generic machine, 2) how does one make clones? Is there a tutorial I can use? I have Kubuntu installed but feel Cinnamon Mint might be better since a lot of people seem to have that one. Also, I like your description of it being “the easiest to get up and running and to use in VirtualBox”, which is what I am after. So, I’ll install my version of VB & install 5.2.24, but I guess I will have to do the hard acceleration amendment, right? And I’ll have to turn off 3D acceleration, right? Hi, Klaas. I’m starting to zone out (it’s my bedtime over here), but I’ll try to get back to you tomorrow. But really quickly, if you’ve installed the stable release of VirtualBox 5.2.24 *and* its associated version 5.2.24 Extension Pack in Windows, you should *activate* 3D acceleration in your Linux virtual machines. Once you’re inside your Linux virtual machine, you then need to install the version 5.2.24 Linux Guest Additions for hardware acceleration to work. I’ll try to answer in more detail tomorrow. There is actually a clone command in VirtualBox to clone a virtual machine. I don’t remember the terminology, but basically you can create two types of clones: one that remains connected to / dependent on the source machine, and one that is entirely independent. Choose the independent one. Typically, the only things I change in the new (cloned) machine are the name of the machine (obviously) and the specific Linux family it is based on. In my Generic Linux Template, I chose “Linux 64-bit.” In my Linux Mint x64 Cinnamon machine, I changed that to “Ubuntu 64-bit.” In other distros, I’ve changed it to whatever family they’re part of. One last thought before my other eye closes: don’t be stingy when choosing a virtual hard drive size. If you choose an expansible hard drive format (again, I don’t remember the exact terminology), in Windows it will only take up the space you’re actually using. Making your virtual hard drive bigger later on is kind of a pain. I hope I can give you a clearer, more complete answer tomorrow. First of all, I apologize: I provided the wrong VirtualBox version numbers in my initial post. I was writing from memory and really should have double-checked for something so important. I’m pretty embarrassed. I’m far from expert at VirtualBox and a newbie at Linux. The following is based on my personal experience, and I welcome corrections from more knowledgeable users. The version of VirtualBox I have installed on my Windows 7 SP1 x64 system is 5.2.4 r119785 (Qt5.6.2). The version of the Extensions Pack I have installed in VirtualBox is also 5.2.4r119785 (checked by doing VirtualBox > File > Preferences > Extensions). TIP: The real-time protection in some anti-viruses may prevent Extension Packs from being reinstalled, downgraded, or upgraded. (This appears to be the case with Kaspersky.) If installation fails, it may be necessary to temporarily disable real-time protection. (2) Name the new machine something like “Generic Linux Template”. Make sure the Type field reads “Linux”. In the Version field, choose “Other Linux (32-bit)” if you are going to primarily be running 32-bit Linux distributions. Otherwise, choose “Other Linux (64-bit)”. Click Next. (3) Choose how much RAM you want to take away from your Windows system and give to a single virtual machine. My computer has 8GB total RAM and I chose 2GB (2048MB) as reasonable, given that I don’t run more than one virtual machine at the same time. Click Next. (4) Choose “Create a virtual hard disk now”. Click Create. (5) Choose “VDI (VirtualBox Disk Image)” as the Hard disk file type. Click Next. (6) If drive space and virtual-machine-file backup time are at all a concern, choose “Dynamically allocated” for Storage on physical hard disk. Click Next. (7) In File location and size, I *believe* the new-machine-creation routine defaults to the folder that you last saved a new machine to. I had previously created a “Templates” group (subfolder) for my VirtualBox virtual machines, so I changed the new generic machine’s file location to that subfolder, but you can accept the default and use VirtualBox’s interface to create a new group and move the file to that later on. In the size field, be realistic and don’t skimp, especially if you are using dynamically allocated storage. I’m not an expert on this, so do some research. I ran out of space in a couple of distros by following their minimalist recommendations, so I jacked my default template’s maximum hard drive size way up to 48GB. Click Create. You have created a basic generic template for a Linux virtual machine. Now you need to customize its settings. (8) Highlight the new machine in VirtualBox’s left panel and click the Settings button. (9) In General > Basic, make sure all of the settings still match what you originally entered (sometimes the Type and Version fields magically change to something different). (10) In General > Advanced, set both Shared Clipboard and Drag’n’Drop to “Bidirectional” (unless you have a good reason to keep them one-way only or entirely disabled). I find being able to copy and paste in both directions, from Windows host to Linux guest and from Linux guest to Windows host, particularly useful. (12) General > Encryption: Your call. I didn’t bother encrypting. (13) System > Motherboard: You can change the virtual machine’s RAM allocation here if you want, now or later on. For the other fields, I just accepted the defaults. (14) System > Processor: I have a CPU with four virtual cores; I gave two of them to the virtual machine. I left the execution cap at 100% and enabled PAE/NX. (16) Display > Screen: My computer has 128MB of Video Memory; I gave my virtual machine half of it (64MB). I’m on a laptop and don’t run an external monitor, so I left the Monitor Count at 1. I don’t have a reason to scale up my virtual machine’s display, so I left the Scale Factor at 100%. I enabled 3D acceleration. [This is the setting you have to disable if you’re running a version of VirtualBox OTHER than 5.2.4 or 5.1.28 or earlier. If you don’t disable it, you probably won’t get to the graphical log-in screen of a Linux guest when you start it.] I could not enable 2D acceleration because my computer doesn’t support it. (17) Display > Remote Display: Left at defaults. (18) Display > Video Capture: Left at defaults. (19) Storage: Left at defaults. (20) Audio: Left at defaults, except that I enabled Audio Input (as an as-yet-untested experiment). (21) Network: Left at defaults. (22) Serial Ports: Left at defaults. (23) USB: Left at defaults, which for me were USB 2.0 (EHCI) controller enabled. Having access to the AppData folder comes in handy when you want to import your carefully curated Firefox, Pale Moon, and LibreOffice profiles from Windows. Having access to the Fonts folder allows you to import unusual Windows fonts. The Software folder is handy for importing Windows software to try to install in PlayOnLinux/Wine. I love my Wallpapers and having a shared Wallpapers folder makes it easy for me to run the same Wallpaper slideshow in Linux guests as I do in Windows. Obviously, you don’t have to have lots of indivual shares — you could navigate to whatever folder you want from a single C drive share. Having individual shares that get you directly (or almost directly) to where you want to go is a lot more convenient, however. (25) User Interface: I haven’t experimented much with these settings. I chose to show the Mini-Toolbar in Full-screen/Seamless mode and at the Top of the Screen. (26) Click the Settings dialog’s OK button. (*) If you want, you can assign your new Generic Linux Template to a group. (Highlight the machine in the left pane, right-click, and choose Group, or drag and drop it to a new group.) I haven’t used the grouping commands enough to give definitive instructions. I’m sure you’ll muddle your way through to a satisfactory result, as I did. I put my Generic Linux Template is a group I named “Templates”. Just one thing: I recommend that you do your grouping/organizing *before* you back up your virtual machines, in case your backup software doesn’t recognize that they have only been moved and wants to copy them again from scratch to the new location. Virtual machines can take a *long* time to copy, and if the machine itself hasn’t changed (just its location), it makes for an unnecessary system slowdown. You’ve finished creating your Generic Linux Template. (1) Highlight your Generic Linux Template in VirtualBox’s left pane. (2) Right-click and choose Clone. (3) Give the clone a new name, e.g., Linux Mint 18.3 (Cinnamon). Don’t reinitialize the MAC address of all network cards. Click Next. (4) Choose Full clone. Click Next. (*) Optionally, put the machine you just created in a new or different group, e.g., Linux Mint (for Linux Mint distros only) or Ubuntu (for mixed Ubuntu-family distros). (5) Highlight the newly cloned machine and click on the Settings button. (6) In the General > Basic tab, change the Version field to the type of Linux that the distro you are going to install is based on. For example, for Linux Mint x64, that would be Ubuntu (64-bit). For Chapeau Linux, it would be Fedora (64-bit). For GeckoLinux, it would be an OpenSUSE variant. (7) If you entered something in General > Description for the generic template, you will probably want to delete or modify it in the new machine. (8) You can review the rest of the settings if you want. If you know that the distro you are going to install requires an unusual amount of RAM, you could bump that up, or if it requires very little, you could knock it down. If you need to change the maximum hard drive size, that has to be done via command line (Martin recently explained how), and it should be done *before* you install the guest operating system. (8) Click on the Settings window’s OK button. You’ve created a new Linux virtual machine based on the generic template and you’re ready to start it and install a distro on it. And each time you do it, you get to skip most of steps (9) through (25) above. (1) Install Linux Guest Additions in the Linux guest. (2) Add your user account to the vboxsf (VirtualBox Share Folders) group. To install the “correct” version of Guest Additions, in the VirtualBox menu in the Linux guest machine, click on Devices and then click on Insert Guest Additions CD image. If you hit a snag at this point, you’ll have to search the Web for advice. If all goes well, the Guest Additions CD image will load and autorun, and you will be prompted to run the installer. If it doesn’t autorun, you may have to load your File Manager, find the mounted Guest Additions CD image (VBoxGuestAdditions.iso), go into it, and double-click on autorun.sh. If all goes well again, the script will remove previous versions of Guest Additions and install the new one. Reboot the machine and log back in. If you don’t get a software emulation message and you can go into full screen mode, you’re probably good to go. If you get a message that incompatible Guest Additions were found and will need to be manually uninstalled before you can proceed, you will probably need to search the Web for advice specific to your distro. I’ve ignored the warning a couple of times and gone ahead and installed over the old Additions, and everything seemed to work fine, but it’s not recommended. In Linux Mint Cinnamon, it’s easy. You click on the Mint (~Start) Menu button, click on the System Settings button (black background with silver gears) in the left (Favorites) panel, go all the way to the bottom, click on the Users and Groups button, enter your sudo password, click on your user account in the left, click on the listing of groups in the lower right, scroll down, put a checkmark opposite vboxsf, and then OK and close your way out. Restart your virtual machine (or just log out and log back in?) and you’re good to go. In other distros it’s not necessarily as easy. In Chapeau Linux I was able to install a Users and Groups utility that made it possible to join groups via the GUI, as in Linux Mint. In other distros, I’ve had to use the command line. For that, you’ll need to search the Web for directions (as I did). Once you’ve got functional Guest Additions installed and have joined the vboxsf group, you should have access to your shared windows folders from your Linux machine. In Linux Mint Cinnamon, they are displayed on the desktop by default (you can turn that feature off) and are listed in the left pane of the the File Manager (~Windows Explorer). In other distros, you might have to poke around a bit in the file manager to find them. I think they usually end up in a media or mnt folder somewhere. I think that’s all I’ve got. I hope I didn’t make any major mistakes, and again, I’m REALLY sorry for the misleading VirtualBox version numbers I posted initially. Important Thing to Remember: alt-tab works pretty much the same way in Linux as it does in Windows, but if you want to alt-tab your way out of a VirtualBox guest and back to Windows (instead of alt-tabbing around inside the guest), you have to press and release the VirtualBox “home” key first. (I think of it as more of an “escape” key.) The default home key (which you can change) is the right control key. So, unless you changed the default, you can alt-tab your way out of a Linux guest by pressing and releasing the right control key and then doing alt-tab. This is useful to remember when you’re using the guest in full-screen mode and the Windows Taskbar is inaccessible. But if you forget, you can always use VirtualBox’s autohiding mini-toolbar in the Linux guest to minimize the guest’s window. Bonus Tip: The Pale Moon for Linux Installer and Pale Moon itself work really well in Linux Mint Cinnamon. When you become aware that a Pale Moon update is available, you just run the pminstaller script again and choose the Update option. @A different Martin: WOW !!! and I mean WOW !!!! When you mentioned a clearer, more complete answer, I did not expect it to be this clear & complete, this is a complete tutorial. I am glad I have the VB version you recommend, so I will not have to uninstall. I will uninstall Kubuntu, download & install Cinnamon Mint instead, then follow the steps above. Thank you so much for all this, I feel a lot more confident now to once again embark on this “epic journey”. @A different Martin: I started doing the Generic template, and since my Windows version is 8.1/64-bit I wanted to mark the “Other Linux (64-bit)” in the version field. But there are only 32-bit versions listed, 64-bit is not listed, even though my VB version is 5.2.4 r119785 (Qt5.6.2). There is, however, “Other Linux (32-bit)” listed. Perhaps a stupid question: I guess I should download Cinnamon Mint 32-bit, or will Cinnamon Mint 64-bit also run? The Hyper-V platform is disabled in your Windows Feature list. Bottom Line: You might need to change some BIOS/UEFI settings, disable a Windows feature, or possibly even update your BIOS/UEFI. I would definitely do some more googling before updating the BIOS/UEFI, especially if your motherboard doesn’t have a special feature for recovering from a bad flash. (I’ve never bricked a motherboard when upgrading its BIOS, but I have bricked a printer, a CD drive, and a lovely pair of stereo Bluetooth earphones with bad firmware upgrades. The printer was under warranty, the CD drive was cheap, and I just said goodbye to the earphones, which I’d gotten on clearance, with deep regret.) If it’s just a question of changing a few options in the BIOS and/or in Windows, go for it. If you have to update the BIOS, it depends how risk-averse you are. You might “need” a new BIOS/UEFI anyway to fix the Intel Management Engine vulnerability and to support mitigation of the Meltdown and Spectre vulnerabilities. It was recently announced that Intel botched its initial release of the Spectre microcode fix, so if it looks like your motherboard/computer manufacturer is going to support your computer with an updated BIOS/UEFI, you might want to wait until Intel has got its act together and your motherboard/computer manufacturer has something solid to work with. @A different Martin: Bingo ! I followed the “Vonnie trail”, took the plunge into the BIOS & changed the Intel Virtualisation to “enabled”. There was no VT-d.
Back in Windows I checked the Hyper-V but there was none. So, I finally opened VB, and the 64-bit is on the list. So I can now follow your tutorial above. BTW, I have no confidence in BIOS upgrades, I have only heard of problems (the Intel “fix for Spectre/Meltdown the latest example), which statistically is probably not a true reflection of reality, but I feel that some of the bugs/malware is hype up. I am not sure I will go for the S/M (no pun intended) fix. Anyway, my 2-bit rant stops here. Once again I want to really thank you for helping out with both the tutorial and the internet 64-bit issue search, I am almost embarrassed by the amount of help you gave me. Undoubtedly we’ll meet again on Ghacks. Bye for now. I administer — “look after” is more like it — one old Windows 7 laptop (thankfully not my own) that was rather dramatically slowed down by Microsoft’s recent Meltdown fix. It’s not slated to get a BIOS update, so the owner is left with the choice of (a) living with the barely tolerable slowdown, (2) disabling Meltdown protection, or (c) replacing Windows 7 with Linux and seeing how that goes. To assess the viability of option (2), I would have to determine the real-world risk presented by Meltdown, in the wild … on an ongoing basis. (Spectre, which is supposedly harder to exploit, is not going to get fixed on it, period.) It’s the owner’s secondary backup laptop, and he works in a Windows- and Mac-only outfit, so installing Linux would essentially take it out of the backup chain and make it a purely personal PC. Anyway, the point of that story is that I, too, wonder what real-world threat is posed by Meltdown and Spectre. I’m glad you were able to fix the 32-bit-only problem in VirtualBox so easily … and I hope I didn’t make any major mistakes or poor choices in my step-by-step instructions. (My confidence has been shaken by the version-number gaffe!) Definitely evaluate each step using your own best judgment. I created a Linux Mint clone from the generic template as per your steps. Then tried to install Mint, so in VB I highlighted the cloned machine & clicked on the Start button. It then asks you where the iso file is, so I point the VM to it. It loads & I get the Mint start screen. It has pre-selected “Erase disk and install Linux Mint”. On the one hand that seems to be the right thing, on the other hand it scares me when I read the comment below that “This will delete all your programs ….”. I’ve been updating Linux Mint in place for a couple of point releases rather than doing a fresh install from scratch, so it’s been a while, but I’m pretty sure you “Erase disk and install Linux Mint.” I think the warning is there to make extra sure you don’t accidentally install over a previously installed system, which would wipe out data files stored on the guest system’s virtual drive, which would be irreplaceable if you hadn’t backed them up outside of the system. For now, your virtual hard drive is partitioned but its partitions are empty. I hope that works okay. I’m going to be out most of the day, but if I’m not too pooped by the time I get back, I’ll check back to see if you have any more questions I can answer. In the meantime, I vaguely recall that that there are a few good articles and YouTube videos on installing and setting up Linux Mint Cinnamon. Maybe they can answer any questions you run into in my absence, plus, the authors almost certainly know a lot more about it than I do! I’m thinking in particular of an article that was titled something like, “10 Things To Do After Installing Linux Mint.” I didn’t follow *all* of the recommendations, but I’m pretty sure I did follow *some*, and I learned something from the others. Good luck! Hey Different Martin, sorry I did not react earlier because for your last reply I did not receive a mail in my Inbox. So just this to let you know I saw your recommendations. I will implement them & will let you know in a few days how I got on. Cheers for now. No worries. I figured you had other things to do and/or that all had gone well. We all have lives… By the way, I may have misspoken when I said that your virtual hard drive was already partitioned at that point. Maybe it was just empty and still waiting to be partitioned. As I wrote, it’s been a while since I did a fresh install, as Mint’s in-place upgrades have been working well for me. Incidentally, I just accepted the installer routine’s recommended virtual-drive partitioning scheme. If you subsequently update your Linux kernels (which are not selected to be updated by default) multiple times, you will eventually get a message that you are running out of space in your boot partition, but as I *think* I mentioned earlier, it’s pretty easy to remove old kernels using the Software Update tool. Most people seem to recommend leaving a couple/few older, “known-good” kernels in addition to the most recent one you are trying out. Also, sorry for typing (1) … (2) … (c) … *That* must inspire confidence in my attention to detail! Hey Different Martin, you probably thought I had forgotten about you, but I had not. On Thursday I had a crisis with my laptop: after starting up it did not manage to complete the start-up & would shut down. Reason: maybe an experimental feature I enabled in Opera. Luckily I had made an image clone the day before when I started with Linux, so I could restore a recent version of Windows & files. After that, I had to redownload Cinnamon but after installing it there was a “software rendering error” and the Update did not work, neither did bidirectional copy/paste nor file sharing. Scouting around on the internet I found a page where someone with Cinnamon described the same problem. The Linux expert told him that often Cinnamon is too “heavy” for VirtualBox. The person then installed Mate & everything went like I dream. I did the same and lo & behold it worked !! I am very happy you got me on the Mint track because for very long I did not know which version I should choose, and your suggestion as well as your instructions, incl. Vonnie’s (small side effect: I now feel more confident about diving into the BIOS), were extremely useful, so thanks for that. Your comments about wrong versions of Guest Additions & installing a new version on top got me worried about this aspect. I found a site with instructions how to 1st get rid of the wrong version Guest Additions and then to bring in the right version. the exact same one you suggested the day after. It is a great site, though I have not gone through the whole tutorial yet, and like you mentioned, not everything there is necessarily applicable to my situation. The author assumes Linux is the main OS, which is not my case of course. So now I will continue with the customisation/fine-tuning, and familiarise myself with Linux. I am almost sure I will get to like it a lot, and as & when my laptop is due for replacement I may well make Linux my main OS and run Windows as a host in VB. Once again, thanks for all your help, patience, and understanding!! Wow, it sounds like you went through the wringer! It’s a testament to your foresight that you had a recent disk image to restore. I’m glad you got Linux Mint MATE working. I have an 8-year-old, middle-of-the-road ThinkPad, and Linux Mint Cinnamon works fine for me; the problems you experienced with it sound *very much* like a Guest Additions issue. I know MATE is supposed to be lighter and faster, but I’ve read comments here and there that its GUI is more limited than Cinnamon’s and that you’re forced to resort to the command line more often. That’s arguably a *good* thing for learning Linux, but my eyesight and typing accuracy are not what they used to be, so I’m heavily biased in favor of GUIs. There’s no reason you couldn’t create a second guest, installing Linux Mint Cinnamon this time, now that you’ve got the hang of getting the correct version of Guest Additions properly installed, but if you’re convinced that it just isn’t a good match for your computer, fair enough. I’ve certainly run into my share of distros — maybe even a majority of the ones I tried — that I simply could not get to work to my satisfaction. I haven’t done it myself yet, but I flagged the article for future reference. Different Martin, you mention allocating shared folders, which I did. But I read a number of comments telling me that editing files in those folders with Linux and Windows will lead to a mess because the 2 systems handle charcaters, names, and others aspects differently. Since you use shared folders you surely edit the files in both OS environments: what is your experience with that? It seems to me your experience must be good, messless so to speak, otherwise you would not recommend sharing. Hmmm. I’m trying to think. I may only have edited and saved some shared LibreOffice document files, some JPGs, and some XML files as a test, and I didn’t run into problems. Doing some googling, I see that some people *have*, usually in special circumstances that don’t apply to me. I’m pretty conservative with data and configuration files that are hard to reproduce or replace. Other than for testing, I don’t use my Linux guest machine as a production environment for important shared Windows files. Moreover, in Windows I maintain versioned backups of personally edited data files (automatically) and at least one backup of most important program configuration files (either automatically or, in the case of LibreOffice and browser profiles, manually). The primary way I use my shared Windows folders is for the purposes I mentioned earlier: importing LibreOffice, Firefox, and Pale Moon profiles (and sometimes exporting the Firefox and Pale Moon profiles back to Windows); loading and saving Session Manager browsing sessions; importing unusual fonts; importing installers for use in Wine; viewing pictures, videos, and ebooks; and running Wallpaper slideshows. I could probably do significant LibreOffice work on shared Windows files from my Linux guest without worrying too much, but Linux Mint is a generally conservative distro and its version of LibreOffice is older than my Fresh version in Windows, so I don’t. I’d be wary of working in other programs on other, possibly less “robust” file formats. Thanks a lot, I understand your thinking behind the shared folders now. I will also refrain from editing the same files from both environments. Interestingly, you seem to have your Linux guest machine mostly as a testing machine, which means you are still a Windows guy, like me, or me like you. I do like the principle of Linux, need to get to know it a lot better, but would be interested in my next machine being Linux primary and Windows guest. Time will tell how I will feel then. Yes, I’m definitely using VirtualBox as a testing and learning environment, not as a production environment. (Having an older laptop with integrated graphics doesn’t make for very snappy virtual machines.) I used PCLinuxOS exclusively for a year, around 11 years ago. I learned the older version of KDE pretty well but next to *nothing* about Linux itself: I didn’t *have* to because *everything just worked* … *all the time*. (My biggest complaint was that the old version of OpenOffice was a marked step down from the old version of Microsoft Office. LibreOffice has done a lot of catching up with MS Office since then, and then some.) At present, I’ve decided to quit using Microsoft OSes by the time Windows 7 reaches end of life, so I wanted to see which current distros and desktop environments I liked best, and once I narrowed down my choices, to play around with them and see how robust and stable (“update/upgrade-borkage-resistant”) they were over time. I’m sure the biggest learning curve will come when I end up doing a Linux bare-metal install, but I’m now pretty confident I’ll end up being reasonably happy with it. @Different Martin: I received a reply from you in my Inbox yesterday but I can’t find it here, which is I use one of your previous replies to reply to. Yes, you saved me a lot of frustration with your tips. Before we corresponded I tried to set up VB with Ubuntu but it did not work. Now I have a set-up up & running thanks to you. 5.2.4 r119785 IS THE MOST RECENT GOOD VERSION FOR LINUX. The Extension Packs for other versions since 5.1.28 r117968, including the most recent final release (5.2.6 r120293), do not support hardware acceleration in Linux guests. 5.2.7 r120323 is the version number of the developmental Extension Pack that Oracle released in an attempt to address the hardware acceleration problem in 5.2.6 r120293. It did not work for me. My apologies for the misleading version numbers! It looks likes the developmental Extension Pack for fixing VirtualBox 5.2.6’s Linux-guest hardware acceleration problem has since been updated to 5.2.7 r120528. VirtualBox 5.2.4 with Extension Pack 5.2.4 is working okay for me now, so I don’t know whether or not I’ll take another shot at experimenting with VirtualBox 5.2.6 and Extension Pack 5.2.7-xxxxxx. If I do, I’ll try to remember to post about it here. I just updated to VirtualBox 5.2.8 r121009 (the latest official release at this time) with the corresponding extension pack, and I installed the updated guest additions in my Linux Mint 18.3 Cinnamon virtual machine. I didn’t encounter any of the Linux-guest compatibility problems that plagued every VirtualBox release since 5.1.28, with the exception of 5.2.4. Short Version: Where Linux guests are concerned, it’s apparently safe to update VirtualBox again. Yes, Mike, it’s great to have Linux tutorials, but I’ve found what applies to Windows applies to Linux as well. I recommend a backup of a system before any major updating or upgrading to a newer version–Windows or Linux. For VB issues, it’s a completely different thread, but I many users want to use VB or VMware Player for the Linux distro on the Windows host. The installation is simple along with the Tools; however, it would be perplexing to some. Then, there will be those users who want to start with a “dual boot” scenario. The idea is wonderful; is each user really going to go through the entire read each time to find his/her distro commands? Don’t know . . . . There are articles about how to back up your system already posted, such as using Timeshift. Sorry, Mike. I posted this before I saw your earlier promise of upcoming articles on dual-boot. I use both CLI and GUI on Arch/Manjaro/Antergos and Linux Mint. For general purpose updates and installs the GUI is often more convenient to use. But if something is more troublesome (AUR packages sometimes) or requires adding a PPA (Linux Mint) I will use the command line. to not allow anything but M$. Buy a 2nd HD for it so you can save the windows install if you later go to sell. I have 4 dedicated Linux laptops each with a different distro on them. slowest is a core2 duo…..Has Lubuntu on it & struggles a bit sometimes. Im gonna try Peppermint8 on it someday. First gen i5 would be a good floor, kinda future proofs it a bit. put it on a DVD, & Start your computer up that way. You gat a bare metal look as the OS. Do you like what you see? Try several before you install any one. Its like a car …youll know its for you when you test drive it. I consider myself to be a dabbler as I DO NOT use ANYTHING but point & click. Yes you will find that most of Distrowatches beginner linuxes can be set-up & used that way. I have never done a dual boot & Never used a virtual machine. Why make it more complicated,…? Your set-up seems to be a lot more complicated than having 1 machine with VirtualBox installed which can take as many distros as you like.